Future Foams is committed in being proactive to reduce our impact upon the environment. Apart from minimising our offcuts, our excess polyurethane foam is compacted into bales and sent to another plant which manufacturers the foam into floor underlays. Our polystyrene offcut is also recycled by being condensed into raw block and exported to China where it is converted into hard plastics and sent back to Australia as sellable product. 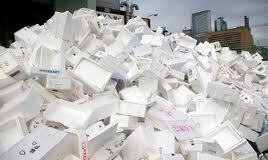 Polystyrene is an inert product that doesn’t break down in the environment, so all care should be taken, for it not to end up in land fill. Our metal drums are compacted and recycled.